Some of you may know, that one of my biggest joys is finding amazing vegan food in Austin. I love vegan/vegetarian restaurants, but I also really dig fine dining, and I’m always determined I will find something and eat divinely. 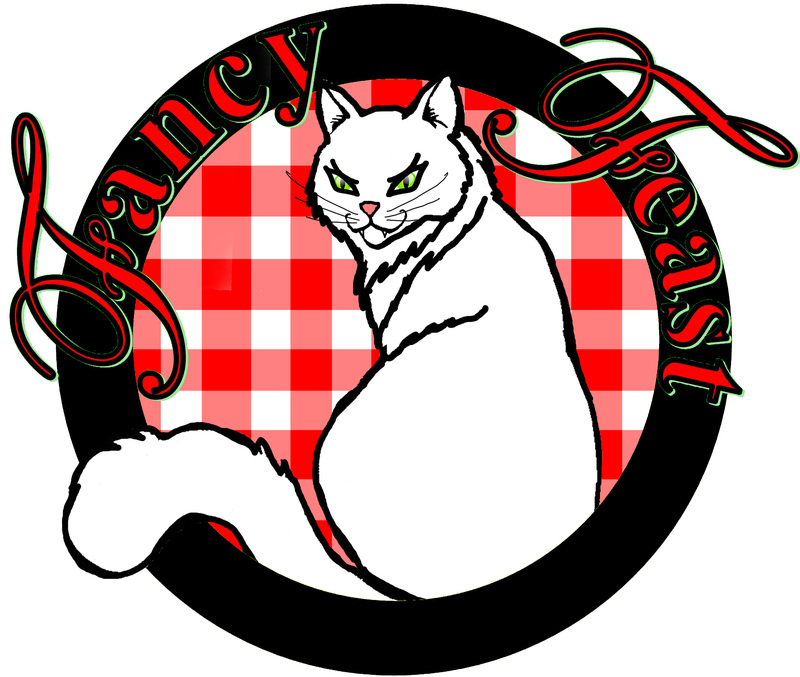 sooo, Fancy Feast was born, the brainchild of vegan blogger extroidonare Lazy Smurf . 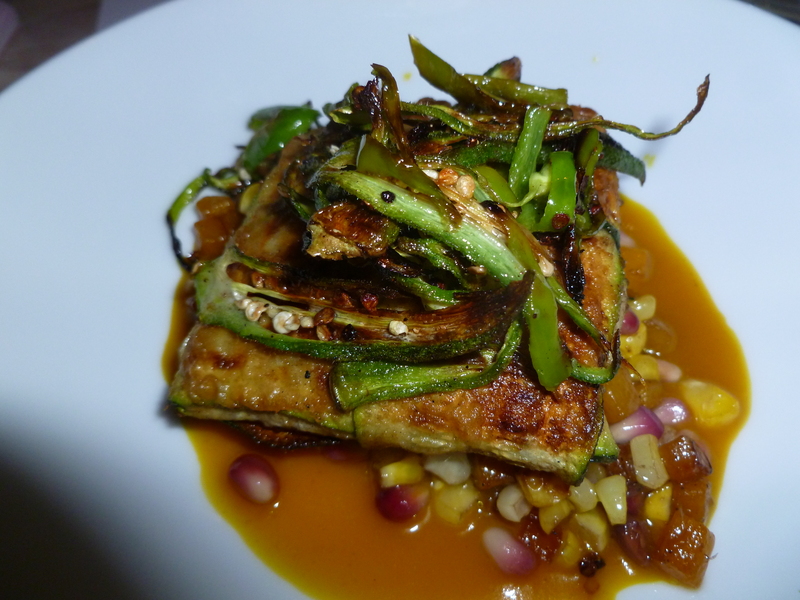 Each month we will eat at one of Austin’s fine restaurants and blog about it. We do call ahead and let them know we are coming. Which is actually something one should always do if vegan, because sometimes you will get the most spectacular special meal on the face of the planet. 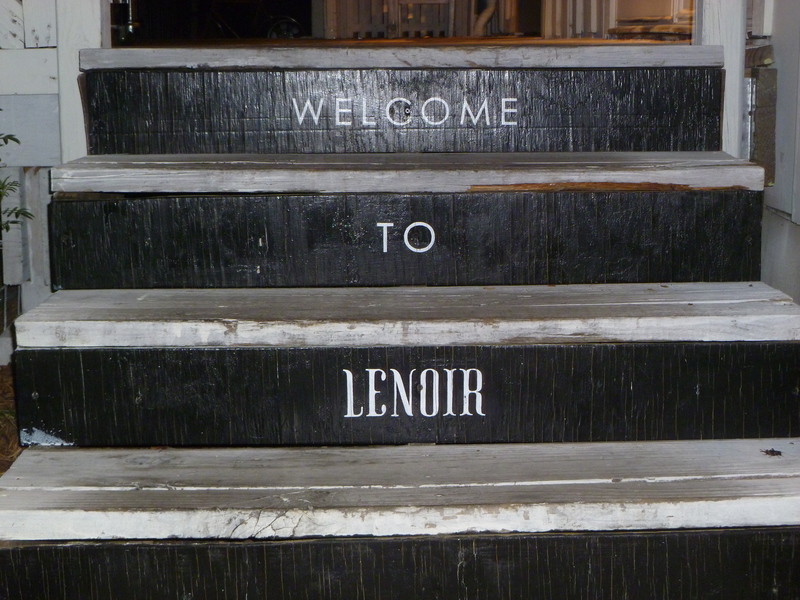 Our October and inaugural Fancy Feast was at Lenoir – located at 1807 S. 1st. I ate here once before for my birthday, and decided it was a favorite, and I love buying gift cards for client closing gifts here, it’s just so charming inside, cozy, understated chic, intimate and of course very delicious. As we had called before, they were very ready for us, and we were told that the chef, Todd Duplechan had prepared a special 4 course meal for us. The usual protocol there, is prix-fixe menu $35 and you can chose any 3 from four different sections, Field, Sea, Land & Dream. You can see the menu online to get the gist. An extra course is $10. we didn’t ask for 4 courses and we were charged for it. I may not have chosen that but it was a delightful treat to get dessert, something often lacking for vegans at restaurants. On to the food: Everything was very delicious so I’m going to try not to over use that word, just assume it was! 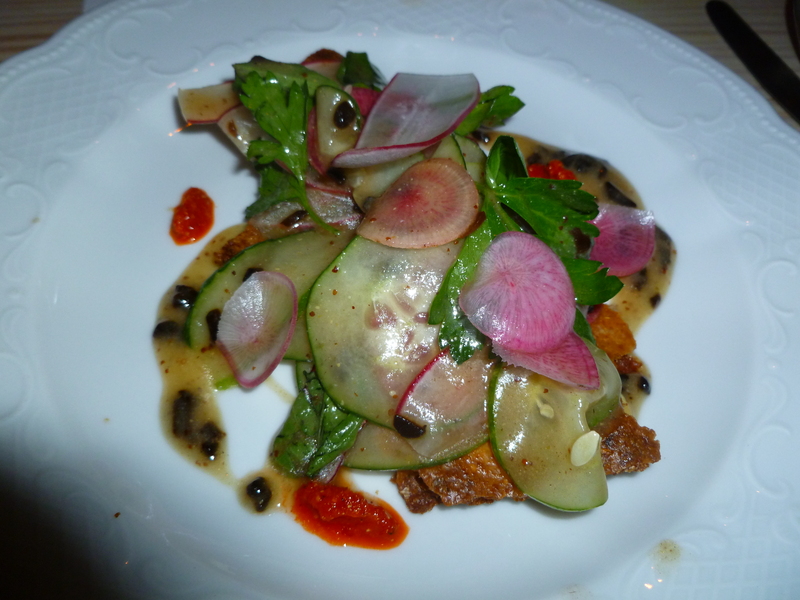 COURSE ONE – was a salad of radish, cucumber, a black garlic dressing made with meyer lemsons, on top of a coconut flat bread and tiny dots of chow chow which he described as a fermented hot sauce. The dressing, though made without oil was so creamy, and my favorite element was the flat bread, I could have had several more helpings! 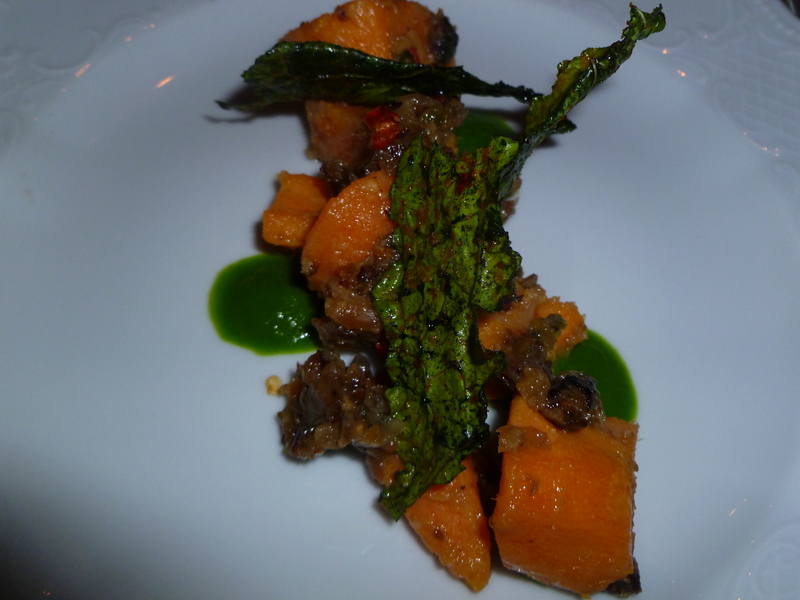 COURSE TWO – sweet potato, mojo de ajo (a garlic sauce), arugula puree, candied chiles, kale chips & my favorite element, a sweet crunchy topping that Chef Todd called a granola, I can’t for the life of me remember how he said it was made but trust me, you want to eat it. COURSE THREE – quinoa and roasted eggplant, wrapped up in a packet made from thinly sliced summer squash, sitting on top of butternut squash curry, okra, shishito peppers, corn and pomegranate. Chef Todd mentioned how we were transitioning seasons, hence the summer & winter squash in the same dish. The presentation was so delightful. The fun surprising bites of corn and pomegranate really made this dish unique. I noticed from reading the menu that our dishes were made up of elements from all over the menu, put together in different combos. COURSE FOUR – dessert! 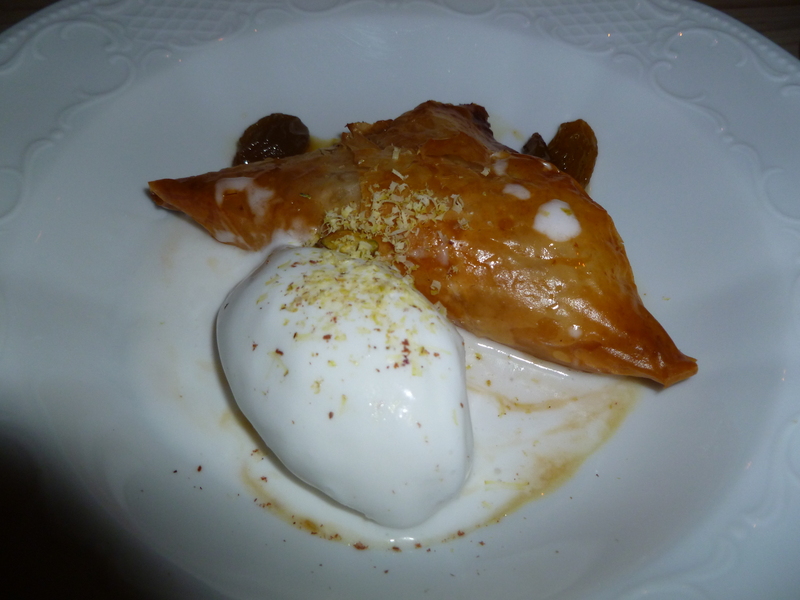 filo apple pie with coconut sorbet, rum raisins & pistachios. This was sooooo good. I have always loved the combo of warm sweet pastry and cold ice cream, like cobbler a la mode, and this satisfied that love perfectly! I hope you enjoyed this first Fancy Feast! Let me know your fave spots around South 1st and also if you have been to Lenoir Austin and what you think!